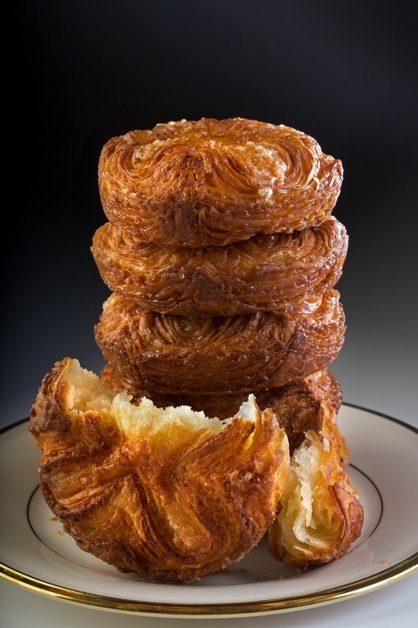 Kouing Aman may very well be on the verge of making an artisanal presence in the United States. Our national obsession with the flavors sweet and salty and caramel is a perfect fit with this specialty pastry that originated in 1865 in a town named Douarnenez in Brittany in the northwest of France. The name Kouing Aman, also spelt Kouign-Amann, comes from the Breton dialect of the Celtic language and translates as butter cake. Anyone who has tasted one will clearly remember and know why it has this name. 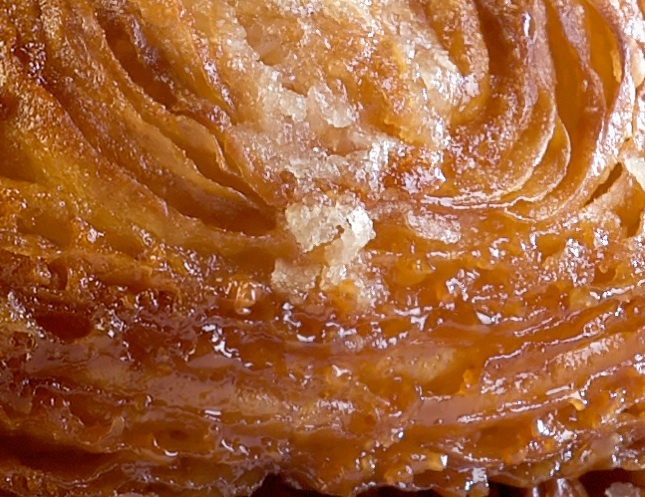 If this pastry is news to you, Kouing Aman is essentially an out of this world extension of the croissant. All of the same basic techniques are used as for croissant: dough mixing, lamination, dividing, and fermentation. The formula though dictates a needed change in the process of nearly all of the steps. A typical Kouing Aman formula will have double the butter (salted) of the typical croissant and about 10 times the sugar. Because of these differences, it is required to change the processing of the dough. Without reviewing croissant technology in depth, this article will focus on the departure from the croissant and the specific applications to the Kouing Aman. The formulation of this pastry is very similar to standard croissant dough but it is a little more salty, sweet and rich. Bread flour with a protein content of about 11.5 percent should be used to create enough strength to form the pastry. 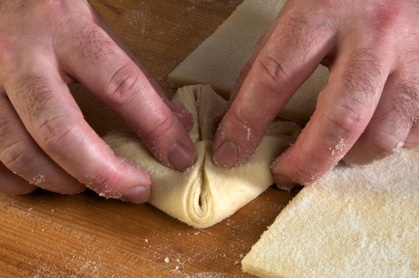 If making by hand, 25% of the flour can be pastry flour to make the dough more extensible. There are two ingredients that are used in lower levels than the typical croissant for the kouing aman dough: water and sugar. The dough for Kouing Aman needs to be stiffer (55% based on FW) and water is used in conjunction with milk powder. All of the other ingredients are more: salt (3% FW); butter (10% FW) and yeast (2% FW). Kouing Aman benefits from the use of a preferment because it has a quick processing time. In order to add some flavor and not too much strength, prefermented dough is used at 15% of the FW. The roll in fat for kouing aman is salted butter at 50% of the dough weight and there is an additional 40% roll in sugar. Mixing should be kept to a minimum. All of the ingredients should be added to the bowl at once. With the dough hook, mix for 3-4 minutes or until the dough has reached good incorporation of ingredients. It is not advised to develop the dough because it will gain strength during the first fermentation and lamination and it is essential to have an extensible dough for lamination. The ideal final dough temperature is 74F/24C and after mixing the dough should undergo the first fermentation for 1 hour under refrigeration. The basic techniques for lamination are used however the butter block will be thicker than for croissant and the second and third folds have the addition of sugar. It is important to use butter that is soft and pliable, yet not so soft that it will absorb into the dough. The first single fold should be done normal as for croissant. If using a dough sheeter, the second fold should be done right away, if processing by hand, allow the dough to rest 30 minutes in the refrigerator. Once the dough is sheeted out for the second fold, apply a third of the sugar for lamination over the surface of the dough. Next, give the dough a single fold and reserve in the freezer for thirty minutes. 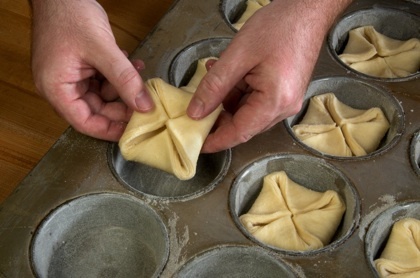 The third fold is done exactly the same as the second: once sheeted out, apply a third of the sugar for lamination over the dough and fold the dough in thirds. Again, reserve the dough in the freezer for thirty minutes. Allowing the dough to relax longer or in the refrigerator may cause the sugar to become liquid, which renders the project very difficult. 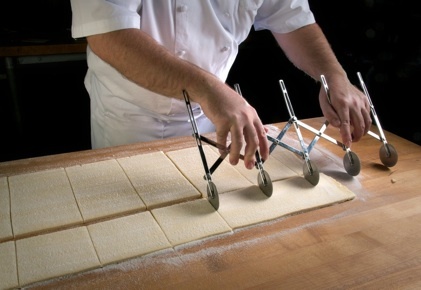 After the dough has had three single folds, the dough can be sheeted, divided and shaped. Before beginning the sheeting and makeup, the pan cavities need to be brushed with salted butter and lined with sugar. Next, sheet the dough to 15 inches wide and down to 4.5 mm thickness. Cut 5” by 5” squares and fold the four corners of the squares in towards the center of the square (see photos 1 & 2 below). Next, deposit into the pan to proof (see photo 3 below). These pastries do not get egg-washed. Kouing Aman should undergo about one and a half to two hours of fermentation for the final proof. The ideal proofing temperature is 80F and relative humidity should be 65. Kouing Aman should bake at a lower temperature and longer time than for croissant because the dough is thicker and has more sugar. When baking in a rack convection oven, a good starting point is 350F for 20-25 minutes. Once baked, the pastries should be a dark brown color and they should be turned out of the pans within a few minutes of being removed from the oven. Kouing Aman is a pastry with a sort of cult following. From just a few (significant) changes in the ratio of ingredients to the everyday croissant formula and process is transformed into something extraordinarily special. Those who know Kouing Aman, seek it as it is addictive. How can one not fondly remember the sensations of eating it and the unique textural differences between the crust and the crumb and the richness in flavor from the slightly salty, buttery and caramel flavors? With all of the upside from this pastry, it is surprisingly not more common. Pay close attention to the process, and be sure to not eat too many! Download the Kouing Aman formula here.